Barb Wooler, director of Crisis Response for Encompass World Partners, has sent this update. 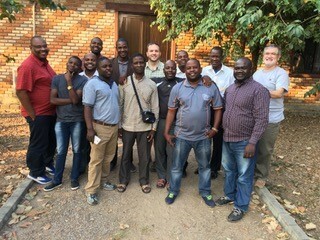 Pastor George Stagg (back center) with Mozambican pastors. Rain had been falling for a full week before Cylone Idai made landfall on March 4th, 2019. By the time the cyclone (hurricane) struck, there was no place for the water to go, so it spread laterally. One such inland “river” was reportedly 31 miles wide, carrying along and depositing millions of tons of mud and debris. On March 3, as the cyclone was barreling towards Beira, Mozambique, Pastor George Stagg had just completed a pastoral training stint there with their local partner and was boarding a plane to return home to the Twin Cities, Minnesota. The next day, the powerful cyclone made landfall. To date, over 750 people are known to have lost their lives in the three African countries in the impact zone: Mozambique, Malawi, and Zimbabwe. This number is rising every day now as the flood waters slowly recede. With the country’s roads, bridges and infrastructure heavily damaged and farmlands and livestock devastated, it will be a long way to recovery. Encompass Crisis Response is grateful to partner with George Stagg and the Twin Cities Church, a Charis Fellowship congregation in Minneapolis/St. Paul, Minn., in helping the Beira church in Mozambique reach out to people in need both in the church and local communities. With the Twin Cities Church and the church in Beira already in a several year-long church-equipping project, the avenues and relationships are already in place for this outreach. Encompass Crisis Response is raising funds to be used for immediate relief supplies and ongoing needs for months to come as people rebuild their lives and recover from their losses. These funds will be entrusted to Twin Cities Church, who passes on 100 percent of what is sent them to the Beira church in Mozambique. Give online here, indicating the amount of your tax-deductible contribution.